Update 04/04/19: Goal achieved, thanks to donations coming from our network. If you still want to donate, feel free to contribute with our work through the main donation page. Update 04/03/2019: Thanks to generous donors, we reached our goal of $500. Help us raise $1,000 by Friday. Our partners in Pine Ridge need our help: The South Dakota reservation has been hit hard by the severe flooding that has plagued much of the midwest for the past two weeks. Many roads are impassable. Homes have been damaged, and residents have been stranded since the flooding began. Access to food and clean drinking water is increasingly limited. The Oglala Lakota Nation has declared a state of emergency on the Pine Ridge Reservation in South Dakota. 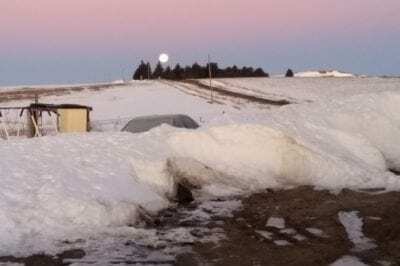 A blizzard followed by rapid snowmelt caused fast-rising waters on the reservation, jeopardizing nearby dams and overflowing creeks and rivers. The fallout from severe flooding has made many roads impassable and trapped some residents in their homes for over two weeks. Many reservation towns have been without water since a main water line washed out from flooding. Some stranded residents are relying on supplies being delivered on horseback. Please help us show our friends in Pine Ridge some love from the Amizade network! Our goal is to raise $1,000 by Friday. All money raised through this campaign will go towards the purchase of bottled water and the costs of road and home repairs for local residents with flood damage.